Memories of my great day in Philly, April 10, 2019 at the Ieee.org Deep Tech Pharma, Philadelphia. As I sit here with business cards in front of me, I am remembering my time exploring Deep Tech pharma, with some old and new friends. 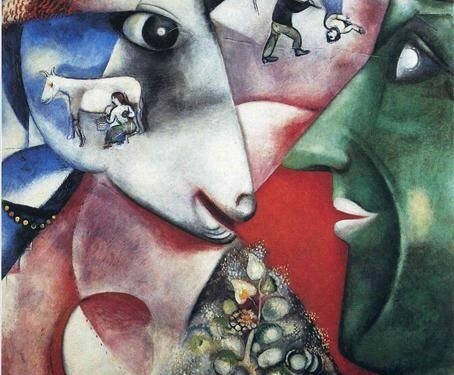 Firstly, many of you know that my favorite metaphors that I regularly inhabit are The Wizard of Oz and Marc Chagall’s I and the Village. Picking up the rental car yesterday, I could not help but notice the license plate: KANSAS! Oh I know we are still in Kansas with our Cystic Fibrosis Community, the pilot and technology solutions. The trip to Philly from Cedar Grove, NJ did not prove uneventful as I was listening (Audible) to a new book “Holy Envy”(finding God in the faith of others) by Barbara Brown Taylor. I accidently turned on RT 1 instead of staying on the turnpike. Then I was set to take Rt 130 Ah Hah…a new road. I had not been on Rt 130, and I noticed nurseries and I knew I had to bring my farmer hubbie back here. And then there is Mt. Holley, oh the birthplace of the Quakers and their great work with abolition. Mt Holly has a Visitor Center, now I was really distracted. I had to get serious and put “Philly” in my google maps…I crossed the Delaware and easily found 1900 Ben Franklin Pkwy. I know it well, home of beautiful museums! Drexel History Center had its own gifts, the library room was filled with woodwork and old portraits of famous looking men. As I was settling in, I think it was Ed Bukstel who commented: “Look at all these men, as he pointed to the pictures around the room”…it was Danielle who immediately pointed out a woman in the back right corner. Wow, all these men and only one woman. The day was beginning and it was a whole new format. I trust Maria Palombini to run the best events and I was not disappointed. The new format: we sat in a semi circle, with colored papers and markers facing us in the middle of the circle on the floor. Then, we met Heidi, a perfectly composed woman, lovely, serious, and focused. We were entering into a new type of classroom. (Since I am a teacher, I was excited). Heidi explained that she had worked in this open format for years. She had used it in Silicon Valley. Maria, I could see, was really excited about this new way too. The premise is that most great conversations take place in the “margins”, so why not create a conference based on the happening conversations rather than canned talks. Let’s see, I am game. And it turned out, so was everyone else! I think there was roughly 30 people, mostly men, perhaps 6 women. Now, Heidi began to explain the process. As an Open Space event, we are invited to speak and share, pose questions or ask for input. If we have an idea for a session right away or think of one in the middle of the conference, we are welcome to propose it and run a session. Anyone who cared to “call” a topic could get a paper and marker(from the floor) and write down the topic that they would agree to lead. As we pinned the topics to a bulletin board in the front of the room, we would also choose a time and a place for our meeting. We were all in charge! It was fun to notice that everyone was participating and in for the Deep Dive. Of course, my topic would be “Patient Centricity, finding a way for patients to own, access, monetize, and permission their data. After that, for me, the topics blended together, some highlighting the DATA and finding the value, or the creative technologies that individuals were building. After a round of introductions, I realized this meeting would be different. Remember, I have been a “patient advocate” before the term was even invented. In 1996, a community grew around a website named “CysticFibrosis.com”. I have just been the curator of a very special community. I have tried to be there for them in every way possible. As a technology teacher, I am fascinated by all the possibilities and I am sure I could say to Kevin Kelly: this community is “What Technology Wants”. Having attended tens of conferences through the years, mostly as speaker, sometimes as moderator, I was also use to just “fading into the woodwork”. Pharma had NOT heard of patient centricity and they formally looked away from patients. I was there during that dark time and am always a bit hesitant to introduce myself: “Jeanne Barnett, I lead a patient community”. As I review the conversations I had yesterday, I am excited to note, that now pharma really does want to be “patient centric”. People were seeking me out. I was the only patient advocate. Some of the conversations revolved around exciting work that these pharma employees were doing on the “side”. These were thoughtful inventors and I wanted to hear their stories. Maria presented the canvas and Heidi the paint and the beautiful colors! I always exist as “the upside down” woman. I visit her often at the MOMA…just to make sure. There she is, trying to explain the “upside down” houses, all the rare diseases. And at this conference I was joined by another “start up”, the lovely young woman with hijab. I did not have a good enough chance to speak with her. I am realizing, that while people were “seeking me out”, I didn’t have the opportunity to reach out to some others I found interesting! This was a very full conference. This new format worked in surprising ways. I always attribute the “church” to those representing some higher up authority. For me, that was Jim, who works with the FDA and I could tell was speaking of some very high-level block chain projects…Medicare and beyond. At that table, in the bees room, we were discussing putting “value” on the data. Dany was leading. Dany has wonderful technology, he is creating where people can have “conversations” with each other. I asked him “Is it like Wikipedia, except with real people answering the search”? He wanted to meet me at the end of the day, and he did. I love his passion, and his willingness to see how the CF community would benefit. Gordon, Dany and then Dr Matt are represented by the man walking among all the houses with his tool. I loved being at Gordon’s table too. He was so authentic, speaking of all the ways a deal can just “fall through”. I know that feeling well! It was a very colorful day. I loved the openness and also two sessions in the morning, an hour lunch and two sessions in the afternoon. It was not long and drawn out. I was never bored. And if I was, Heidi made sure to tell us all we could “get up” and move to another group. Wow! She knew that was counter cultural. It is instilled in us “not to be rude”. I did walk out of one topic. It was near the end and I just had to try it, see if I could! To me the data is in the milk. The cows provide the data. The green man is the money guy. The big pharma was there. I loved speaking with my friend Munther. He gave an interesting insight into how blockchain works in a large pharms. There is a lean team and they work with non profits and patient groups. As I meet with different pharma about my CF community, I loved getting his first hand insider perspective on how this works. The last session: 3:30-4:30 we were back in our semi circle and asked to volunteer to review our day. I was a bit fried and when it came to my turn, I had to pass. Munther quickly picked it up and gave a detailed explanation of our session. I was amazed at those who took notes and shared brilliantly. We were a team now. At first, we were strangers. I placed the characters in the painting. Yet, I was left with one last surprise. There was something in the middle of the circle! It was four cases. These were the prizes and Heidi said something to the effect: “if you really are appreciative to someone you met today, please offer them the prize”…before I knew it, Ed stood up, took the mike and offered me the prize! I was not shocked at that point. Maria and so many others made me feel important as a patient representative. This was for sure “a new feeling” for me. I thanked Ed and all and even later this very young thoughtful man working in ComCast: Mike McCoy (he is also a teacher) mentioned that something I had said had made a difference. I love the blockchain necklace the green man wears and his offering to the cow…the “tree of knowledge”. It will take big pharma and lots of investments to take care of all the cows and hence keep the milk(data) flowing. After all that excitement, I would get to sit quietly with Dr Matt and he would tell me about his work. He is creating an app that recognized the face and voice of the user. Wow, perfect for security for my CF community. He spent time with me and I hope we can work together. Thank you all! 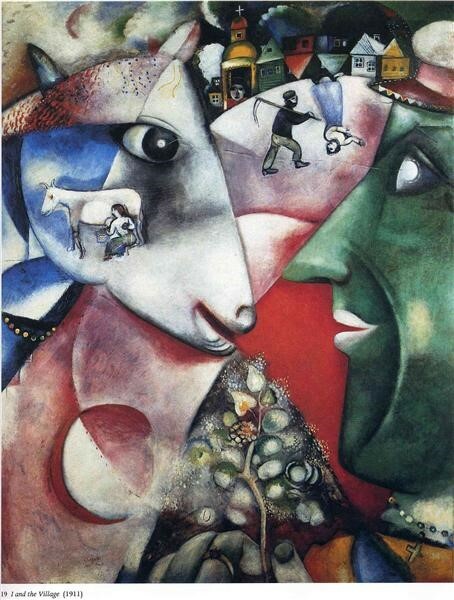 I had a mesmerizing Marc Chagall “I and the Village” kind of day! Written by: Imogene on April 12, 2019.